The earth-moon system changed significantly at what is recognized on earth as the Permian Triassic (P-T) boundary. The earth and moon actually form a binary pair, in other words, a dual planetary system. When the earth is thought of not as a single planet, but as part of a system, it is possible to produce a model which can explain the Permian extinction and its aftermath. The Close Approach Lunar Model (CALM) hypothesizes that a close approach brought the moon near enough to the earth to produce a secondary tidal heating event in the earth-moon system. This tidal heating event can answer a multitude of the unexplained geophysical and biological questions that exist in the earth-moon system. Two hundred and fifty million years ago, at a time known as the Great Dying (Permian-Triassic Boundary), a devastating event struck earth. This event caused some 90% of earth’s species and perhaps 95% of all marine species to go extinct. It appears that a variety of things combined to “cause” the Permian extinction. The central event, however, was a massive volcanic eruption which pumped huge quantities of flood basalts onto the earth’s surface. This volcanic episode is known today as the Siberian traps. The formation of the Siberian traps put massive quantities of pollutants and other gases into the atmosphere and oceans, compromising most environments on Earth. The extinction event happened in a very short time frame, but for millions of years to come, life on Earth struggled to survive. It is apparent that the Siberian Traps played a pivotal role in the Permian Extinction. 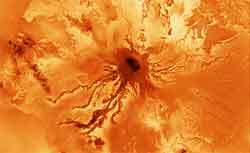 But what drove this very energetic eruption and why did life struggle for so long afterwards? As life began to rebound after the extinction, a new world was forming. The CALM postulates that most of the energy of the moon’s approach was dissipated as heat into the earth’s interior. This stored heat manifested itself by re-energizing Earth’s plate tectonics, beginning in the Triassic and ultimately leading to the runaway green house scenario of the Jurassic period. The heat produced by the moon’s close approach has worked steadily over the last 250 million years to transform the physical shape and positioning of the earth’s continental landmasses and ocean basins; it altered the earth’s axial tilt; and it transformed the atmospheric composition of the earth. The history of life on earth reflects to this very day the slowly dissipating energy left from the event of near lunar approach at what is today known as the Permian-Triassic Boundary. The close approach would also have provided the energy necessary to initiate the formation of the lunar mare. The lunar mare are volcanic flood basalts on the moon much like Earth’s continental flood basalts. This hypothesis of a common tidal heating event can be used to correlate the geologic history the earth to the moon allowing for a unified, system wide, geologic table. The heating of the moon would have been primarily caused by the despinning of the moon. The moon today is tidally locked to the earth. This is why we see only one “face” of the moon. The moon makes one rotation (spins once) for every trip around the earth. This one to one ratio means that the same side of the moon always faces the earth. The powerful tidal forces of a very close earth slowed a once spinning moon, locking it into this resonance with Earth. Not surprisingly, almost all of the lunar flood basalts are on the earth-facing side of the moon. The moon, like the earth, has a non-spherical shape. This irregular shape has been referred to as a tidal bulge. The shape of the bulge seems to confirm that the moon was closer to the earth. Not only closer, but closer much sooner than the current models of lunar formation would expect. The closer moon’s dissipation of tidal energy as heat into the earth’s interior caused the re-energizing of Earth’s tectonic system. If not for this “recharge” the earth might look more like Venus or Mars do today. It appears that Mars once had a tectonic system but the planet’s core cooled, causing the tectonic system to “freeze up”. Mars is much smaller than Earth but Venus is about the same size and though Venus has volcanoes, it does not seem to have an active plate system. The earth very well may have tectonically frozen up, like her sister planets, if not for the secondary heating on a close lunar approach. The high energy tectonic system fueled by the lunar close approach initiated the breakup of the great continent of Pangaea. Pangaea disintegrated spreading around the earth to form the modern continents. This developing tectonic system would produce ever increasing amounts of volcanic gas. Ultimately this increased gas production would lead to the build up of atmospheric pressure during the Jurassic period. The high density atmosphere of the Jurassic period allowed the dinosaurs to grow to their great size. But What about the Dinosaurs? During the Cretaceous period, which followed the Jurassic, the full development of the mid ocean ridge system caused rising sea levels. This moderated Earth’s climate by forming vast inland seas. As tidal heating waned with the retreat of the moon, the atmosphere thinned since less gas was being produced. Consequently the size of dinosaurs slowly declined as the atmosphere thinned throughout the Cretaceous. The oceans also retreated from the land as plate spreading slowed. Seasons caused by growing axial tilt began to appear. Life on Earth was coping with generally cooler climates and more variation between winters and summers temperatures, when finally the asteroid hit that dealt the final blow to the dinosaur. The new earth left behind by this retreating moon is a changed world. Continents shifted; seasons began; the world that we know today came to be. We don’t live on a steady earth that has been and always will be as it is now. The moon has been slowly retreating from the earth ever since the Permian-Triassic boundary and the energy has been slowly dissipating. The seasonal earth of today is a product of past tidal interactions between the earth and moon. Our modern earth is a vital and dynamic body still reeling from a heating event that occurred in the not so distant past. We live on a dynamic planet influenced by a moon that is retreating away from us. The CALM (Close Approach Lunar Model) takes us back to the dawn of the Apollo age and shows us where science took the wrong turn that changed Earth and lunar science, and left us with more questions than answers. The intellectual buildup leading to the Apollo missions brought on some of the greatest engineering and scientific achievements of mankind. Scientific collaboration and speculation were at a fever pitch as the first manned excursions to the moon approached. It was thought that science was on the verge of the “big one” and that the Apollo missions would answer the question of how the earth-moon system came to be. Alas, it was discovered that the situation was much more complex than ever imagined. Though the Apollo missions provided valuable scientific data, samples and knowledge, it was roundly agreed that Apollo failed to answer the most important question of all, “How did the earth-moon system come to be?” Interest in the moon as well as the questions of the origin of the earth and moon as a system, drifted off into the many labs and scientific facilities which handled and catalogued the material and information of the Apollo missions. NASA and the scientific community moved on to the space shuttle, space station, and interplanetary exploration, leaving our nearest neighbor to the backyard astronomer. In reality a small cadre of lunar scientists still exists. The Lunar and Planetary Science Institute and its university partners promote and facilitate the continuing pursuit of lunar science.